Emeka is said to have walked into his compound in a dazed and confused state and was on the verge of walking away again when a vigilant neighbour on sighting him raised an alarm by shouting "Papa Ejima!! so you are still alive"
His distraught wife rushed out and instead of running straight in the hands of her husband, simply offered him a plastic chair. 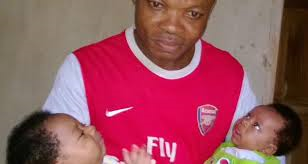 Emeka who hadn't seen his new babies chose instead went straight to them take them in his arms with an adoring smile. Still looking at the babies, he asked: “Where are my other children? How are you people?” and was informed that they were at her aunt’s house not too far from the neighbourhood. According to Mr Uche, he had contemplated suicide on several occasions. He said he could not believe that he was holding his kids for the first time since they were born three months ago. He said “When I left, I initially went to the village where I spent a month. After that, I came back to Lagos but stayed with my friend around Oko-Oba in Agege. I still live with him. He said he was not far from them, but just did not want to return without a better solution on how to cater for his family. He said he was ashamed to come back to that house to see them after he had abandoned them and run away. He said after discussions on phone, his wife told him that they had moved, he went to the old house and asked one of the neighbors who had been to the new house for direction so that he could come and see them. Mrs Uche who thanked God for answering her prayers asked her husband if he was back for good and begged her husband not to leave them again.